The Houtaomuga site is located northwest of Yonghe village, Honggangzi town in Daan City of Jilin Province. The area of the site is around 141ha and the features are concentrated on 55ha area. 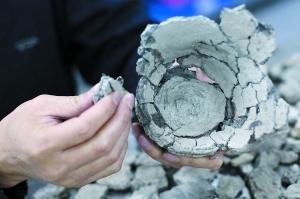 In April 2011, the Cultural Heritage Bureau of Jilin Province, the Frontier Archaeology Center of Jilin University and the Jilin Provincial Archaeology Institute jointly formed the “Jilin Provincial Research Station of Practical Field Archaeology and Site Preservation” and conducted archaeological works in the Houtaomuga site, Da’an and its vicinity in a systematical manner. From July to October 2011, based on preliminary investigations and survey drawings, the research station arranged an excavation in Area A of the southwestern Houtaomuga site. Sixty-three 5m x 5m test pits were planned and the actual excavated area was around 1,505 square meters. Within this year, 67 burials, 152 ash pits, 14 ditches and seven house foundations were identified. Around 140 reconstructed pottery vessels were unearthed together with a small amount of small bronze tools, small stone tools as well as bone tools. Large-scale stone implements only include a small number of grinders, polished bars and stone axes. Copious amount of clamshell, fish bone and animal bone were identified too. After initial analysis, these features can be classified into four periods. The information is valuable for studying the economy and environment in various periods. By using ash pit H92 and burial M45 as examples, including the third layer in certain test pits, pottery mainly are yellowish-brown or grayish-brown in color and contain charcoal inside. The inner color of the pottery was black and tiny plant fibers paralleling with vessel’s wall lines can be seen in some fragments. A small amount of yellowish-brown or grayish-brown pottery contained clam tempers or a mixture of clam and charcoal. The body thickness of the vessels varied between 1cm and 1.5cm, the bases were even thicker. The pottery was fired at low temperature with fragile textures and uneven surface colors. 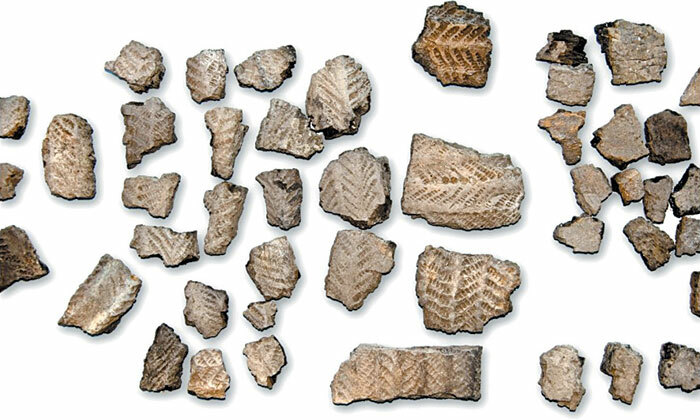 Traces of making pottery from clay circles were identified and the surface of most fragments was peeling off. Most of the pottery vessels were impressed with comb pattern which are mainly in horizontal or slanting parallel line patterns. The cross sections of the impressed lines are in wedge, circular or narrow strip shapes with dense or sparse patterns. Those with deeper lines constitute oval shaped or strip shaped channels on the surface of the vessels. Most of the slanting parallel line patterns constitute leaf-vein patterns while a little amount of them constitute zigzag patterns. Due to the fragmentation of the pottery, it was difficult to reconstruct vessels and complete examples are rare. Judging from larger pottery sherds, it can be confirmed that the typology includes pots with rounded middle parts and basins. Most of them, however, had straight necks with rounded rims. Characteristics of the pottery from period I contained the same general elements like vessels from the Early Neolithic Period in the North Eastern Asiatic Area. These elements included thick texture, low firing temperature, fragile and simple typology. Based on the stratigraphy, the cultural layer from this period is beneath period 2 of Ang’angxi culture, and therefore forms date later than Ang’angix Culture. The only human remains within the burial were under severe petrifaction and should belong to one of the earlier features within the Neolithic Period. This type of discovery filled the chronological gap of the Western Songnen Plain Neolithic Culture. Period II included important contexts of house foundation F1-6, ash pit H70, trench G1 and second layer of most test pits (i.e. the black sand layer). Apparently, some of the ash pits/trenches showed traces of worshiping. The majority of pottery was either yellowish-brown or grayish-brown containing charcoal inside, but only a small amount of fine textured clay pottery was identified. The body of these vessels was in general thinner than that in period I and their body thickness ranged from 0.4 – 0.8cm. The firing temperature was relatively high, which resulted in a hard texture. Decoration was confined to the upper portion and the patterns included attached clay designs, nail pattern, incised pattern, stamped dots or dots in a line. The typology of these vessels included pots in various sizes, a certain amount of small open pots with huge bodies and wide-open rounded pots. Few containers with spouts were identified. The method of using clay circles was used in pottery making. The characteristics of these features are similar to those of Ang’angxi Culture named after Mr. Liang Siyong in the 1930s. 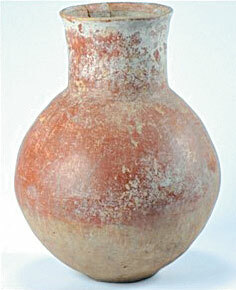 The vessels can therefore be attributed to Ang’angxi Culture. Their discovery further enriches the content of Ang’angxi Culture. Only two burials can be regarded as features of the Houtaomuga period III. Their cultural characteristic can be classified as Baijinbao Culture, which is equivalent to Western Zhou – Spring and Autumn Period. The remains of period IV included 60 burials and two ash pits. Cultural characteristics belong to Second period of Hanshu Culture, which is equivalent to Warring Stage – Western Han Period. Amongst the burials, 10 catacombs were found and the rest were rectangle earth shaft burials with circular corner. The catacombs were firstly identified from the Hanshu period II Culture burial style. Single and joint burials were identified among these burials. Antic disturbances were found in half of the burials and were mostly located above the waist position where the burial offerings concentrated on. From the well-preserved burials, most were extended supine position with their heads facing northwest. The burials were aligned from southwest to northeast. Grave goods included pots or combinations of pot and basin, some of them with ding tripod and jar. Child grave goods mostly contained bowls or small cups.